Seven years ago the Insurance Pro Blog started as a resource to "demystify life insurance." My original purpose was to spread the good word on life insurance--specifically whole life insurance and eventually universal life insurance--as a means to draw attention to myself as a licensed life insurance producer. While the site works for that purpose and we regularly hear from people who found us while researching the topic for a personal purchase of life insurance, we attract more attention from industry professionals than we do from those who simply want to buy life insurance. After nearly 7 years of ignoring that fact, we decided that we could do better. Actually, this isn't the first time we've produced educational content and asked you to purchase it. Our Paid-Up Additions guide has been a surprisingly successful income source for us now going on roughly three years. But this time, we are releasing something more than a a simple pocket manual to use when comparing a very specific feature of whole life insurance products. This time, we present a comprehensive breakdown of all the things whole life insurance has to offer the client who buys it--i.e. things that have nothing to do with the death benefit. I present to you Predictable Profits: Five Reasons your Clients Actually Want to Buy Whole Life Insurance. 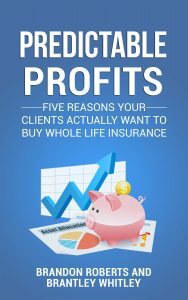 Predictable Profits details what we've found to be the key motivators that move your clients to purchase whole life insurance. Spoiler Alert: most people are motivated by understanding how to use their cash value effectively, not in how much they need the death benefit. Detail how to go about calculating planned payments for a life insurance policy loan when/if a client chooses to use one. Provide numerous case studies to amplify your understanding of the key concepts mentioned above. We wrote this book as a resource for licensed insurance professionals. Make no mistake, this group will certainly benefit the most from this book. We also know that a not so insignificant group of non-licensed folks who have no professional/employment connection to the insurance industry at all spend time reading our blog posts and listening to our podcasts. So if you don't sell life insurance, but you happen to have a hungry curiosity about the subject, we won't stop you from using this book to further your knowledge on the subject. It's hard to know the exact number of conversations both Brantley and I have had with fellow agents who are looking for more specialized information on all matters related to life insurance. In the short term, our solution to the problem was to offer paid consulting, which we have done now for several years. But we can't duplicate ourselves to the degree necessary to handle all of the specialized requests that come to us. So instead, we've decided to build out the resources that will empower agents both new and veterans alike. Our hope is that you will use what you learn to unlock the true potential of life insurance and then take it to your clients and prospects. In the beginning we opted to be greedy. Thinking that we could just use our specialized knowledge to sell people life insurance by highlighting its unique and often overlooked attributes. But the truth is, the number of new clients we can take on each year and effectively manage our current clients with new ones is a figure far below the number of people who truly want what cash value life insurance has to offer. It makes no sense for us to hoard this information and ultimately our goal is to do the greatest amount of good for the greatest number of people. That being said, Predicable Profits is the first of many resources we plan to release. There will be guides, technical analysis, reference manuals, over-the-shoulder illustration training, and in-depth case studies that you can use to ensure a solid understanding of all the stuff nobody else is sharing with you. In the past couple of years our focus on writing content here has fallen off considerably, sorry about that. We've spent a lot of time over the last several months building out plans for blog topics and have actual, documented plans to publishing our long form, detailed articles/posts (weekly for now but more frequently soon). I started the Insurance Pro Blog in July of 2011 as a way to highlight the many great things life insurance has to offer. While some plans have evolved overtime, the core focus remains unchanged. The reception for this site has been truly spectacular and I cannot thank those who stop by enough for the time spent perusing the site. I must also extend an extreme notion of gratitude for those who have taken the time to reach out with commentary on our work (both good and bad). The feedback provided is appreciated beyond words. I'll close today by mentioning that all feedback and questions are welcome. There are certainly times that we get behind and cannot respond as quickly as we'd like, but please know that we read every bit of feedback you send our way and value it greatly. And oh yeah, if you missed it, go pick up your copy of Predictable Profits (with some killer bonuses). Just click here to learn more. Choosing the platform on which you will create your blog is essential. It must be trustworthy and well reviewed because nothing is worse than building and maintaining an entire blog only to have it crumble because the platform has randomly decided to shut down. My suggestion for the platform is WordPress. WordPress is incredibly easy to use and to customize according to your business or blog’s specific needs. It looks trendy, Google loves it, and experts are working hard to continually update the platform, add security patches, and build new functionality. WordPress is free! In fact, WordPress is one of the most successful open source projects ever created and is constantly updated and improved at no cost by an army of volunteer software developers. Now, just because WordPress is free, doesn't mean that the building out a professional blog that can drive traffic and sell products is completely free… You do need to purchase website hosting, possibly buy professional themes and plugins like shopping carts… These things can start to add up, but compared to the corporate ‘all in one' website builders it is still more cost-effective and 10x more powerful! All in all, WordPress is incredibly user-friendly, and will allow you to create a professional looking website and blog that can sell products in an afternoon… Even if you have zero design or development skills.